Without doubt, foliage plants are as treasured as flowering plants in our tropical garden. 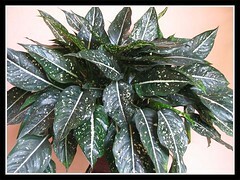 More so if they have variegated leaves and air-purifying properties! Plant type: Perennial foliage plants, native to the tropical swamps and rainforests of Southeast Asia, from Bangladesh east to the Philippines and north to Southern China. Now, popularly cultivated worldwide for their ornamental beauty. Features: Aglaonema is a genus of about 40 species, with numerous cultural varieties and many more new hybrids. 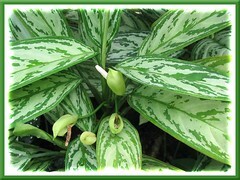 They are long-lasting foliage plants that are chiefly grown for their beautifully patterned leaves. Generally, Aglaonema consists of soft-caned herbaceous perennial plants, ranging in height from 30-150 cm (mostly below 90 cm), though there are a number of species like A. costatum which grow by means of a creeping rhizome. Foliage form is very variable, either broadly ovate or lanceolate to narrowly ovate, or even oblong and elongated, depending on the species. Leaves are evergreen, ranging from 10-45 cm in length and 4-16 cm in width. Also, the beautiful foliar variegation and color is as variable, displayed in many differing and fabulous combination. Mostly, leaves are either solely medium to dark green or variegated in lovely hues of greens, silver or whites but newer hybrids from Indonesia and Thailand have resulted in astounding new color combination of red, pink, orange, etc. Even the colors of the stem petioles have emerged differently from the normal green. 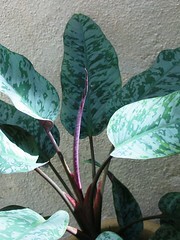 Aglaonema inflorescence is similar to those of the aroid family, comprising of a spathe and a spadix. When compared to the dieffenbachias and spathiphyllum, the Aglaonema flowers are relatively small and inconspicuous, with a light green spathe and a white spadix, usually found below the foliage. Some species like the Aglaonema nitidum ‘Siver Queen’ is a prolific bloomer. 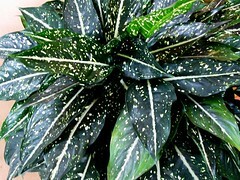 Culture (Care): Aglaonema is one of the easiest houseplant or outdoor plant to grow, needing little attention. Light: Filtered or moderate light to full shade. Keep well away from direct sun that will scorch its leaves. Grows best in indirect sunlight (especially the variegated cultivars), resulting in brilliantly colored leaves. Though preferring brightness and warm temperatures, this versatile plant is very adaptable to low light or shade, but leaf colors will be less impressive. 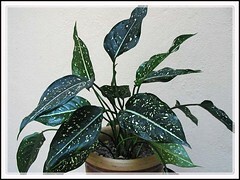 Thus, if the plant is in shade, bring it into brighter light regularly to boost growth. Moisture: Require adequate water regularly but allow soil to dry slightly between watering. Be careful not to overwater which can cause yellowing of leaves. Given its native habitat, it needs fairly humid atmosphere. Soil: Any enriched potting mix, but must be well-drained. Others: A poisonous plant, so be careful when handling it as the sap may cause skin irritation and if taken orally causes irritation of mouth, lips throat and tongue. Remove the insignificant flowers to conserve energy for better foliage production. Keep plant groomed by removing faded or yellow leaves and if its stem become leggy over the years, just cut down to stimulate new growth lower down the stem and use the cuttings for propagation. Increase humidity, by regularly misting or stand the pot on a shallow tray of pebbles filled with water to just below the base of the pot, when weather is hot and dry causing browning of leaf tips/margins. Occasionally, wipe off the dust that settle on leaves to maintain its sheen. Feed once monthly with a liquid fertilizer for foliage plants. It is relatively trouble free except for mealy bugs and red spider mite, so watch out for these. For temperate zones: Aglaonemas are sensitive to cold temperatures. Hence, to prevent damage, they should not be exposed to temperatures below 50 degrees F, especially for ‘Silver Queen’ that is most sensitive, not below 55 degrees F. Water sparingly in winter. For good growth, maintain soil and air temperatures between 70-85 degrees F.
Propagation: From herbaceous stem cuttings that root easily in soil or in a glass of water. Can also be propagated from division. When plant becomes too clustered or root bound, carefully dig out, divide them with a sharp knife or garden space, then repot/replant each division separately. Some species also produce basal shoots or offsets, which can be gently separated, together with their roots from the parent plant and grown individually. 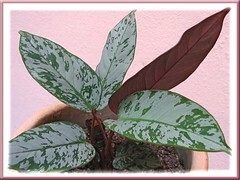 Usage: Plant Aglaonema or Chinese Evergreen outdoors in mixed beds as a ground cover or front-of-border perennials or below shaded trees or shrubs. It makes excellent container plants, whether grown by itself or in mixed plantings. 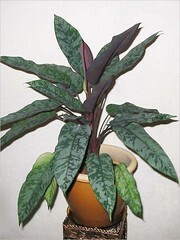 Indoors, due to its great tolerance for low light conditions and resistance to disease, as well as neglect or low maintenance, it is regarded as one of the best houseplants most popularly grown in homes and greenhouses, and widely used for interiorscape in offices, hotels and shopping malls. 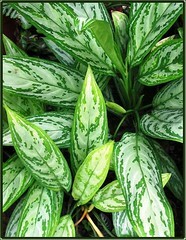 Grow Aglaonema, not only to beautify the home/offices but to purify or cleanse the air indoors as well. 1. Aglaonema nitidum ‘Silver Queen’ – Habit: upright and highly branched; leaves: alternate, narrowly ovate, medium-green and heavily marked silvery-white; petioles: green; flowers: relatively insignificant, light green spathe and white spadix, frequent. ‘Silver Queen’, native to Southeast Asia, is quite similar to ‘Silver King’ which is larger, less branched and with wider leaves. 2. Aglaonema costatum ‘F. Foxii’ – Habit: spreading, giving a bushy appearance; leaves: held singly on long green petioles that arise from the rhizomatous roots, broadly ovate, glossy, deep green with white spots and white central midrib; petioles: dark green; flowers: unknown; native to Malaya. 3. 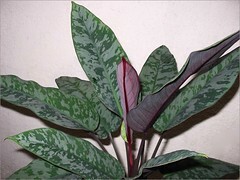 Aglaonema hybrid (ID unknown) – Habit: erect; leaves: alternate, oblong-elliptic, dark bluish-green and heavily mottled greyish-green, underside of leaves and stems (petioles) are pinkish-purple or maroon-colored; flowers unknown? We havehad 2 “Silver Queen” Aglaonema for about 4 yeras — generally doing well.Recently, some inner leaves are turning yellow. Can you please tell us why and suggest what we can do? We live in SF Bay area (Dublin, CA). The plants are inside and get relatively little light — no direct sunlight. Sorry, I do not know why the inner leaves turn yellow. But I do know that Aglaonemas are happiest in moderate light and warm conditions indoors, and outdoors, they grow best with filtered sunlight. You may want to consider relocating your plant into brighter and warmer conditions to boost growth. If we maintain any plant indoor, we normally have a set of 2 pots and weekly exchange indoor and outdoor position of one pot with the other. Yellowing leaves on chinese evergreens can mean several things. 2. Overwatering in too dark and too cool a location. I also give my plants a winter rest. I give mine a good watering once a month(when the plant is almost dried out) in cold winter months and water every 2 weeks in growing. I had my temps dip below fifty and my silver queen wasn’t harmed at all! 3. It may need fertilizing. These plants are heavy feeders. or you might be using bad water. Fluorine, metals or water salts might be killing your plants. Thanks so much for taking the trouble to share your knowledge and experiences, Shannon! We appreciate your generosity. Through sharing we can learn much from one another. God bless you.